If you are planning to get out and about this Bank Holiday Monday then here are the latest updates on the roads and the railways. 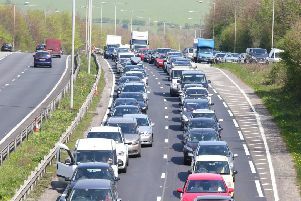 There are reports of queuing traffic on the A27 eastbound just before Drusillas Park, in Alfreston. On the M25, traffic reports suggest the earlier road traffic collisions have been cleared but delays are still expected in both directions. On the railways, another day of major engineering work means all Southern services will be affected. Southern said an ‘enhanced Saturday service’ will be in place throughout Monday. Southern has advised passengers to check before they travel. You can do so here.